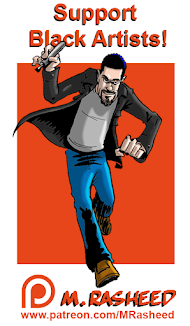 MEDIUM: Scanned pen & ink cartoon drawing w/Adobe Photoshop color. SUBSCRIBE and receive a FREE! 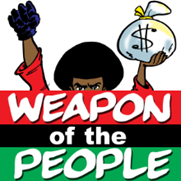 Weapon of the People eBook by M. Rasheed! 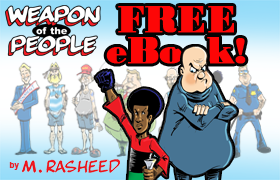 FREE Weapon of the People eBook! Shop Art & Craft Supplies! 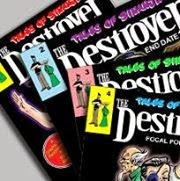 Destroyer Comics - $3.99 eBooks! Tales of Sinanju: The Destroyer, book six "Eviction Notice"
Tales of Sinanju: The Destroyer, book seven "Numbers Game"
Tales of Sinanju: The Destroyer, book eight "Invisible Hand"
Tales of Sinanju: The Destroyer, book nine "Tyrant's Heart"
Tales of Sinanju: The Destroyer, book ten "Carbon Copy"
Monsters 101, Book One: "From Bully to Monster"
Monsters 101, Book Two: "Heroes & Devils"
Monsters 101, Book Three: "Devil Take the Hindmost"
Monsters 101, Book Four: "Late Enrollment"
Monsters 101, Book Five: "Monsters & Monarchy"
Monsters 101, Book Six: "Pieces of the Puzzle"
Monsters 101, Book Seven: "Eye in the Sky"
Monsters 101, Book Eight: "Little Boy King"
Monsters 101, Book Nine: "Speak of the Devil"
Monsters 101, Book Ten: "Class Dismissed"
FANTASY MATCH: Muhammad Ali versus Floyd Mayweather, Jr.
"I see the world as a multi-layered, encrypted message—encrypted for countless reasons, by numerous sources. I believe our job as actively-engaged humans is to decode these messages for our own use and to document them for the greater body of human literature at the means each individual has at hand. As an artist—specifically, a cartoonist—that is the means/medium I use for my own decoding duties. 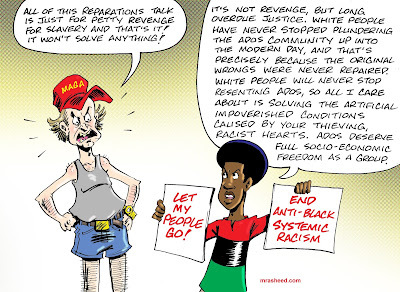 Through my research, I use logic, reason and intellect to intuitively follow the knowledge thread that intrigues me, connecting the dots from pattern recognition, and producing the cartoons that form my socio-political analysis." 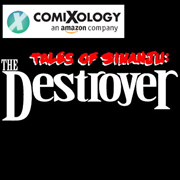 Treat Yourself to a MONSTROUS Binge Read! 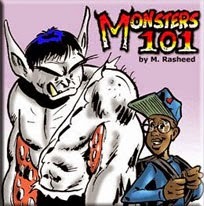 Serialized Chapters of Monsters 101 - only $1.00 each! Notes While Observing #14: The Toxicity of Unsolicited "Advice"